Dr. Jim DiCarlo is Department Head and Peter de Florez Professor of Neuroscience in the Department of Brain and Cognitive Sciences and an Investigator at the McGovern Institute for Brain Research at MIT. He earned his Ph.D. in biomedical engineering and M.D. from The Johns Hopkins University in 1998, and did his postdoctoral training in primate visual neurophysiology at Baylor College of Medicine. 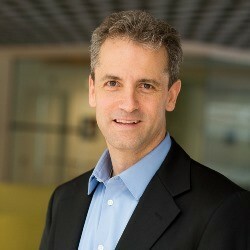 He joined the MIT faculty in 2002 and was awarded tenure in 2009. He is an Alfred Sloan Fellow, a Pew Scholar in the Biomedical Sciences, and a McKnight Scholar in Neuroscience. His group is currently using a combination of large-scale neurophysiology, brain imaging, optogenetic methods, and high-throughput computational simulations to understand the neuronal mechanisms and fundamental cortical computations that underlie the construction of these powerful image representations. They aim to use this understanding to inspire and develop new machine vision systems, to provide a basis for new neural prosthetics (brain-machine interfaces) to restore or augment lost senses, and to provide a foundation upon which the community can understand how high-level visual representation is altered in human conditions such as agnosia, autism, and dyslexia. Afraz A, Boyden ES and DiCarlo JJ. Optogenetic and pharmacological suppression of spatial clusters of face neurons reveal their causal role in face gender discrimination. PNAS 112: 6730-6735 (2015). Pinto N, Barhomi Y, Cox DD, and DiCarlo JJ. Comparing State-of-the-Art Visual Features on Invariant Object Recognition Tasks. IEEE Workshop on Applications of Computer Vision, Kona, HI (2011). Hung CP, Kreiman GK, Poggio T, and DiCarlo JJ. Fast read-out of object identity from macaque inferior temporal cortex. Science 310: 863-866 (2005).